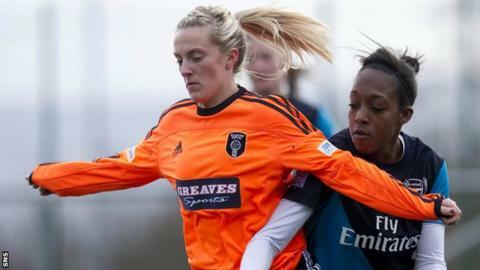 Scotland's most successful women's team, Glasgow City, would be a welcome addition to the English league, according to Arsenal chief operations director Vic Akers. "I would think it would be a good idea, personally," said Akers. "Whether the federations can come to an agreement that it could happen, I'm not so sure, but in terms of us as a club, we would embrace it." English champions Arsenal visit Glasgow for a pre-season friendly on Sunday. Glasgow City have expressed interest in pursuing a move to the English league because they feel the game is not progressing at a pace which matches the club's ambitions, both in terms of development and investment from the football authorities in Scotland. They have won the Scottish Women's Premier League six years in a row. However, any move by a Scottish club to play football in England - or any other association country - would have to be approved by the governing bodies in both countries and would require approval from Fifa and Uefa. It could also have implications for clubs involved in the men's game, with the oft-publicised notion of Celtic or Rangers moving south being raised as part of the debate. Akers, a former professional player with Cambridge United, set up Arsenal in 1987 and, having played matches against Scottish clubs, feels Glasgow City would have plenty to offer. "We need some good opposition that's fairly local," he said. "Last year, we came up and played three Scottish sides and it was a big success. We're coming back to play the champions this year, and we're looking forward to it. "We played Celtic and Rangers last year, and all were good games. "I've been in women's football for 25 years, and every year is a plus for the game. "It's progressing and we're now getting games televised. It's now coming to the stage where national games are being televised too and investment has come into the game from the FA. We see a big future for the game now. "The most important thing is having quality games and someone like a Glasgow would fill that void. We would have another team that could compete." However, despite his keenness to see a Scottish team compete in English football, Akers would not go as far as merging the men's game with the female variation of the sport. "I don't think it'll ever be on a par, because they're two different games," said Akers. "The women see it as their own sport, and it isn't in any way going to take over from men's football. "The game itself is slightly slower and not as aggressive or physical. But the game has come on immensely, and you see a lot of technically gifted people now."